What happened to plain old jelly beans? In my recent role as the Easter Bunny’s assistant, I needed to pick up a few things for the youngster’s basket and Easter morning egg hunt. Pretty simple stuff: jelly beans and Peeps. I went for the Peeps first. The sugar-coated sugar blobs have become a centerpiece of Easter fun for many people over the past few years. Peeps are dressed up and positioned in various scenes — the Star Trek Tribbles episode, the Simpsons, a rock band, motorcycle gang, trying to register for Obamacare … Well, maybe not that last one. But you get the idea. In a past lifetime, I worked with a woman who was a Peeps aficionado. Her Peeps needed to be aged, though, like fine wine or firewood. She’s store them on a shelf over her desk in the office and monitored their progress to stale-ation. That’s not a real word, but it describes the situation. Once they’d toughen up, to the point where they were chewy but just short of solid, she’d feast. Back to my Easter Bunny duties. Peeps. Easy to find. One, two, three enormous shelf stacks devoted to Peeps. 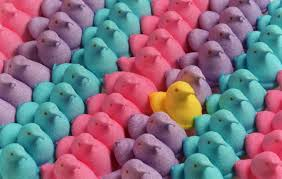 Peeps of every color and flavor. Suitcase-size packages (again, I exaggerate). All I wanted was a simple, traditional, 3-pack of yellow Peeps. I’d settle for pink, because it’s a favorite color. The smallest package of Peeps I found was three 3-packs, encased in cellophane. I didn’t want 9 Peeps. I wanted 3 Peeps. Nope. The display at the end of the aisle had the top-shelf Peeps, I discovered. There was a 3-pack — but it was a 3-pack of Peeps that had been dipped halfway in chocolate. Mmmm. This sounded like a great idea — for parents whose kids aren’t already overdosing on a sugar rush. OK. I bought the 9 pack. Pink. They raised an eyebrow as part of the Sunday morning hunt. “Ooh, Peeps.” Off to discover the next hidden egg. Next stop for the (unopened) Peeps: The second shelf of a kitchen cupboard. Where the heck are the jelly beans? I slowly walked up and down the Easter candy aisles of a popular store (OK, Target). Up and down, back and forth. No plain jelly beans. I commented loud enough for people to hear that it was impossible to find plain old regular jelly beans (I have a great deal of practice talking to myself or no one in particular). The immediate reaction of people in the vicinity was to ignore me, but take 2 or 3 steps away from me. Tropical flavor. Bubble gum flavor. Bacon flavor. OK, I didn’t see any bacon flavor. But it would’ve been a big seller, I’m sure. Finally, I settled on some variation of speckled “egg” designed jelly beans, which held promise of near-normalcy. To be fair, the hunt wasn’t entirely bean-less. I hit the local $ store and found a bag simply labeled Jelly Beans. I tore open the bag and took out a clump of stuck-together jelly beans a pried a couple loose. I don’t pass up many opportunities to consume sugar, but these were downright nasty. Trash. There’s still hope: If those 3 packages of Peeps stay stashed in the kitchen cabinet long enough, they’ll be ready for munching. P.S. I don’t remember who you are, but someone asked my daughter what she thought would happen if you put a Peep in the microwave. “It’s funny if you’re not the one who has to clean the microwave!” She doesn’t need anymore great ideas like that. She has plenty of her own. My kid fed me a vomit-flavored jelly bean as a joke. It really did taste like vomit, and the taste lingered long after brushing my teeth three times. It made me wonder who in their right mind had the idea to even invent a vomit flavored anything.